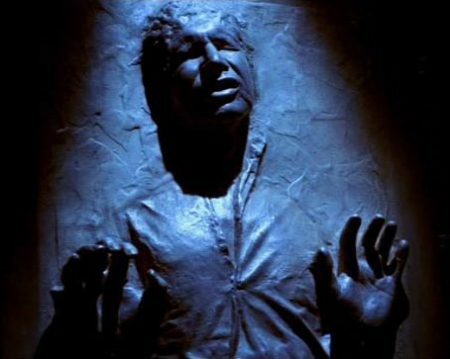 When I heard that Firebox was selling a Han Solo in carbonite ice tray I was on the case faster than the Millennium Falcon on the Kessel Run. Sorry – I know I bang on about Star Wars quite a lot on London Baking, but when there’s a chance to re-create one of cinema’s coolest characters in chocolate form, there’s not a second to be wasted. 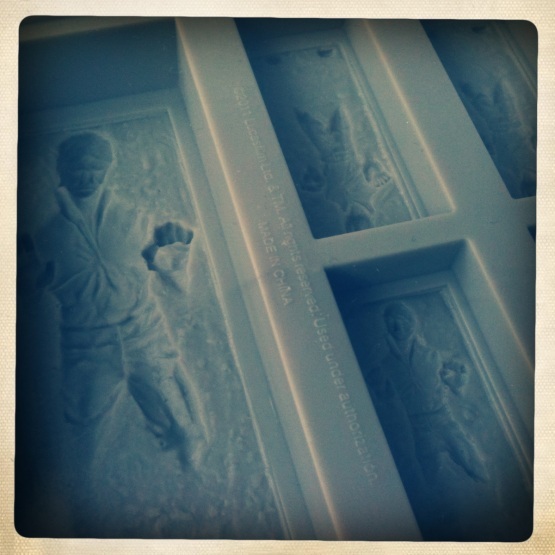 Although it’s billed as an ice tray, it can also be used for other things like chocolate and jelly, so I set about trying to craft some chocolate that actually resembled the fictional carbonite compound that Han was frozen in (I clearly had too much times on my hands last weekend). It’s really not rocket science. All you need to do is melt the chocolate, pour it into the mould and leave it to set, but if you want a few pointers then please do read on. You can use any type of chocolate you like – milk, plain or white – the higher the quality the better. 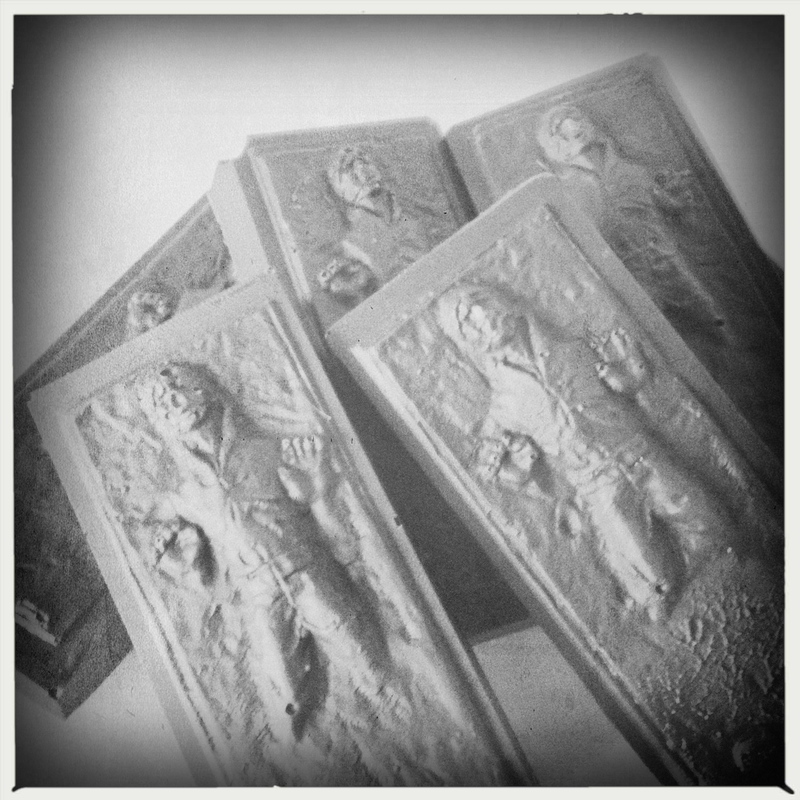 If you want to make your Han Solos grey like mine then you’ll need to go for white chocolate. To melt the choc, pour a small amount of water into a saucepan and bring to the boil. Turn the heat down so that it’s simmering gently. Then break 150g of chocolate into small pieces and plonk in a heat-proof bowl and sit the bowl on top of the saucepan, making sure that there’s some distance between the water and the bottom of the bowl. Stir until the chocolate is melted and then remove from the heat. If you don’t intend to colour your chocolate, then simply pour it into the mould – it should be just the right amount to fill each segment to the top. Smooth the surface with the back of a spoon or a spatula and clean off any access around the edges (this will make it easier to pop the chocs out of the mould once they’re set). The chocolate should set at room temperature (provided that it’s not a really hot day), or you can bung the mould in the fridge to speed up the process. The temperature of your kitchen or fridge will determine how long the chocolate takes to set, but it should be solid and ready for scoffing within a couple of hours. Once set, simply pop the chocolates out of the mould. To make ‘carbonite grey’ chocolate, you’ll need to add some black dusting powder (a little at a time) to white chocolate and stir until you get the colour you want. Water-based food colours are a no-go as they won’t mix with the chocolate. For more photos of the mould and the chocolates that I made, head over to my hands-on write up at Pocket-lint.com. 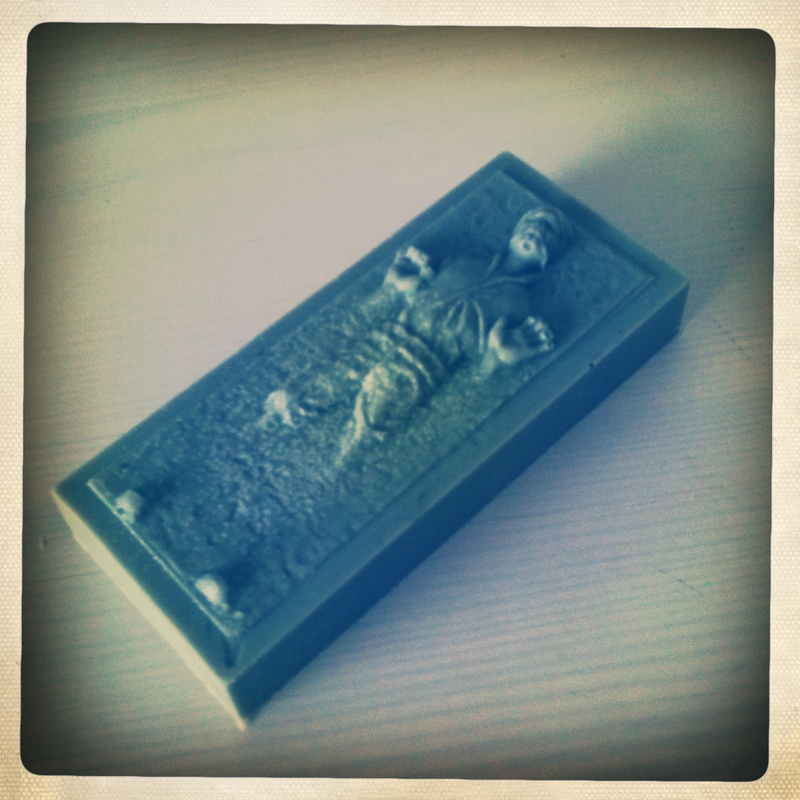 The Han Solo in carbonite ice tray is available from Firebox for £9.99.